Take your dorm laundry bag to the dorm laundry room in style when you have to do laundry with our Two Color Waves Dorm Snoozies! They're not socks, they're not dorm slippers, what they are is incredibly comfortable foot coverings! Socks can be boring and when you've been wearing them for class all day, you want to have something more comfortable to relax in. When you want to relax after a long stressful day, step into our Dorm Snoozies! Our Dorm Snoozies have a non-skid sole so that you don't slip and slide on your way the dorm laundry room or common room. We said our Dorm Snoozies were incredibly comfortable, and we aren't lying! Our Dorm Snoozies have a brushed fleece exterior and super soft Sherpa fleece inside. They are so comfortable in fact you won't want to take them off! Sadly, you will have to when you go to class, but until then you can wear your Dorm Snoozies to your heart's content! 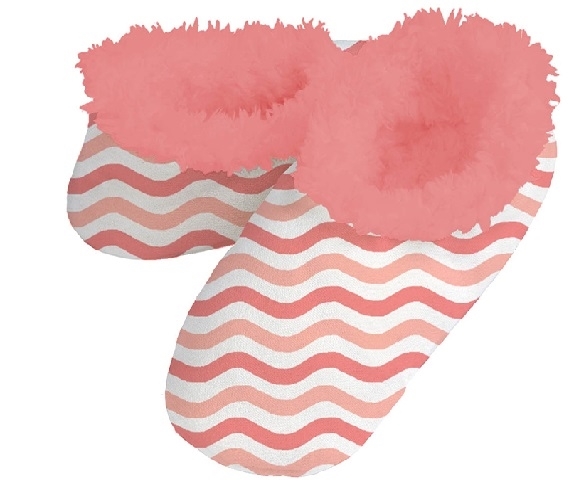 Our Two Color Waves Dorm Snoozies have dark and light coral waves so you relax in style! Your dorm room floor is cold, hard and unfortunately dirty. Protect your feet and keep them warm by keeping a pair of our Dorm Snoozies on your dorm rug next to your dorm bed!